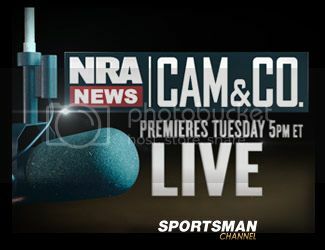 Later this afternoon, at 5:35pm EST I will be making an appearance on the "Cam and Company Show" during their fourth and extra hour of gun rights news on the Sportsman Channel. As you may have heard the show still airs daily on the NRANews web site, but at a new time: 2:00pm - 5:00pm EST. The fourth hour of coverage is on the new and aforementioned channel. During the show we will be discussing the Gun Control initiatives mentioned by President Obama during his recent inauguration speech. Among the measures mentioned thus far have been calls for bans on so-called "Assault Weapons," lower limits on firearm magazine capacities, and full registration on the purchase of all firearms. If you have been following me, you already know how I feel about Gun Control. I will be sharing my thoughts, opinions, and feedback. I will post a video recap link, if and when one is made available later in the day.